What was most impressive about St. Augustine Manor is it's an all-in-one. Mom is Catholic and they have a beautiful church. It's a not-for-profit place and she's seriously considering it. Tiffany helped us and she was an excellent and wonderful person. Mom's looking for a covered garage and they have that. They have a laundromat, a beauty parlor, and they provide meals at an extra fee. The room that she looked at was pretty spacious. It had a full size refrigerator and a four top burner that did not have an oven, but there's another area where she can go and use the oven. It's very acceptable. It's reasonably priced and it has the amenities that she is looking for. They can take her to the doctor, and they have outings and social events. The food is catered. St. Augustine Manor is quite unique. It is older and is furnished in period furniture that goes well with the actual building itself. The people were very nice, most helpful, and encouraged me to come and live there. I was really quite pleased with it myself. I think I could easily live there and be very very happy, but it was my daughter who made the decision not to go into that type of living. There were some people in the activity room, but they weren't doing anything at the time. At St. Augustine Manor we are passionately committed to making a difference in our residents’ lives by providing service of highest quality and value in a supportive environment, promoting the health, independence, and social interaction of seniors. Family living in a home away from home where friends greet one another and delicious meals are prepared and served by Barrack’s Cater Inn staff in a lovely dining atmosphere. Studio, one, and two-bedroom apartments with private bathrooms. Most have kitchenettes. For residents’ convenience, St. Augustine Manor maintains a grocery/gift shop, library, and aviary. Creativity flows with ceramic classes by Dot. Everyone feels lucky at Bingo! Friends enjoy delicious complimentary coffee with friends in the cafe, free wireless internet, at a picnic table, or rocking in one of the comfortable chairs on a flower-filled veranda. Spirits are renewed in a beautiful chapel with daily religious services. It’s all here under one roof at St. Augustine Manor Retirement Community. Cafe with complimentary coffee & pastries. The Chapel at St. Augustine Manor Retirement Community is available for special events such as weddings, christenings, ecumenical services and other religious celebratory events. This 100-year-old chapel provides and warm and cozy setting in beautiful traditional surroundings. The Chapel easily seats 100 people. The GG McGann Lounge is available for special groups such as family reunions, private parties, wedding receptions, business meetings and more. The Lounge accommodates up to 100 people. Kitchen facility adjoins the Lounge are available for use in conjunction with events. Thank you for your interest at St. Augustine Manor independent living retirement community. Please give us a call to schedule a free tour. 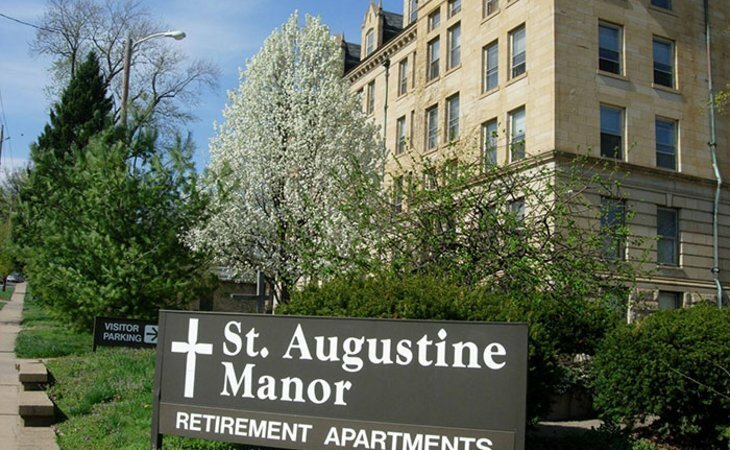 What should caregivers and potential residents know about St. Augustine Manor?